Enjoy a private walking tour of Russia's capital city with a visit to Red Square, one of Moscow's most iconic sites. 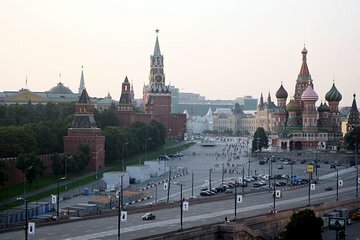 Learn Moscow's fascinating history from your expert guide while exploring some of the city's most impressive landmarks. Marvel at the onion-domed cathedral of St. Basil's, see Lenin's Tomb and visit the stunning State Historical Museum, which exhibits artifacts of Russia history from the Paleolithic period through today. This immersive 4-hour excursion includes round-trip hotel transport.